Last weekend a friend who is uncluttering her kitchen gave me a Bessamer dutch oven. I didn't know much about this cookware, so of course I googled it and found that the majority of recipes and instructions are on their website. I watched a few cooking demonstrations on their site and realized that this was quite a wonderful gift. The best way to describe it is a stovetop oven. There is a vent that you keep open if you want the steam to escape and you close it is you want your meal to steam. It seems this might just replace my aging crockpot which no longer works on low. There is even a recipe for beer bread, so am anxious to try that, and a roast. The pot is super easy to clean, and seems to cook really fast..
Last night I tried cooking in it for the first time, and made pork chops with roast vegetables. I pre-heated the pan, and then put the seasoned pork chops down, but they seemed to be sticking, so I added a tiny bit of oil. Oil is optional. I cooked those for 10 minutes, then turned the chops, which by now were a lovely crispy brown, and distributed sliced pumpkin, eggplant and beetroot around the chops. Back went the lid for another 10 minutes. I could have cooked the chops for a little less, and the veggies for a little more, because although the veggies were cooked they were not browned. It was all very tasty though, and I can see I am going to have fun experimenting with this new cookware. 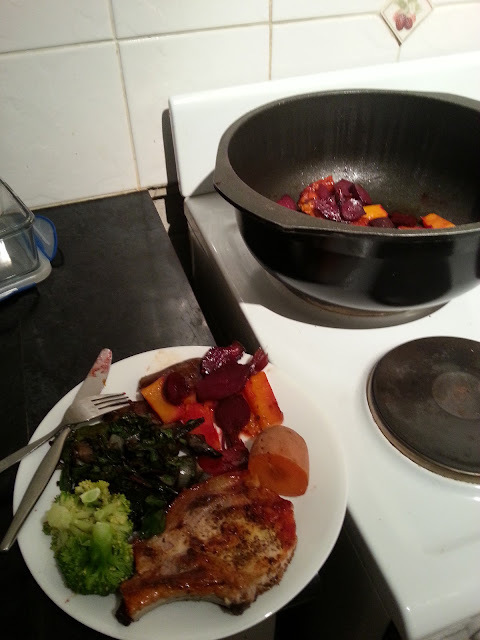 I cooked the broccoli, sweet potato, and greens and mushroom mix separately. I have a cast iron baking tray where I normally roast my vegetables in the oven, and must say that they come out of there lovely and browned and crisp. I do want to try bread in here, and also some type of stew or curry. Do any of you have bessamer cookware? If so what are your favorite recipes? Meg, I love to try new things, and I think I can cook anything suggested for a dutch oven, except use it on the stovetop. My Mum had Bessemer cookware - bright orange as I recall. She used it a lot but mainly for casseroles I think. She loved that you could cook recipes on the stovetop that she would have previously had to cook in the oven. that is what I am finding very useful, especially in the tropical heat. I have a Le Creuset dutch oven which I love but it doesn't have the steam outlet you described. I have never heard of Bessemer. I also use a pressure cooker sometimes. Yes that steam outlet is very nice. I love cooking in this heavy cookware, and have often hankered for a la Crueset dutch oven. I used to use a pressure cooker a lot, but really trying to minimize the amount of kitchen gadgets I have in my small kitchen. I have never heard of a Bessamer, but it certainly looks like a winner! I use a pressure cooker quite a bit, but this sounds much better! these new pressure cookers look much more versatile than the one I used to use twenty years ago! I thought I might not find such a big pot that useful, but have been very happy with it so far. The link for the bag in the last post has diiappeared. I want to make one and would like to see it. Hi Audrey I just checked and it is still working. Maybe it is not clear that you click on the word This. Hope it works for you. it was a really fun pattern to sew!